These mini pumpkin cheesecakes are creamy and SO delicious! 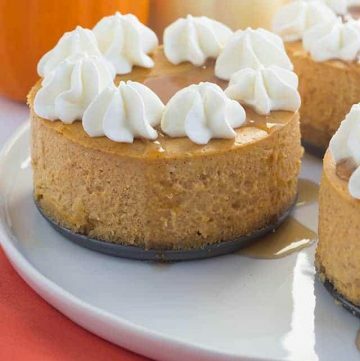 The individual cheesecakes are baked with pumpkin puree so they’re packed with pumpkin pie flavor. 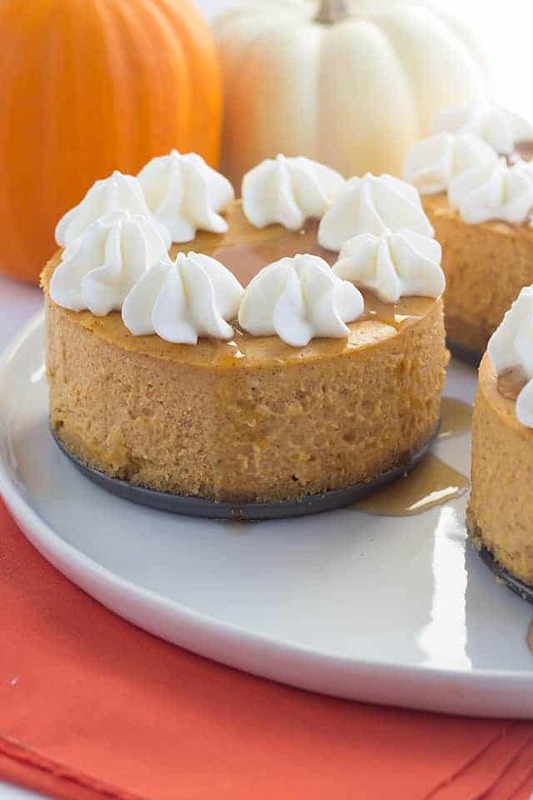 Topped off with maple syrup and fresh whipped cream, this mini pumpkin cheesecakes recipe makes a great Fall dessert, especially for Thanksgiving! It’s been hard to get into the fall baking spirit with all this beautiful weather. It’s so confusing! I live in upstate New York. I should be expecting reports of snowfall in the next week or two. Instead, I’m sporting shorts and a t-shirt one day and 6 layers of clothes the next. Surprisingly no one in the family has been struck down with some kind of crazy sickness from the weather bouncing from 72 one day to 43 the next. Now that I said that, I probably just jinxed myself. I went with maple syrup, because pumpkin and maple syrup go so well together, AND I didn’t have to make it. Of course, you can top your mini cheesecakes any way you want to. 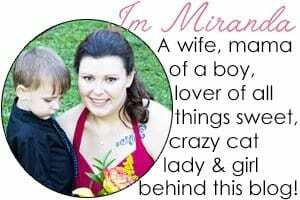 I was on a time crunch shooting these photos. The husband and son were waiting for me to finish up so we could go get groceries. They were actually pretty patient, but it was still early enough that we could sort of avoid the afternoon rush. We have a couple of colleges in the town that we go to for our groceries and the afternoon is the worst. Crowds are my least favorite thing ever! If you love the mini pumpkin cheesecakes recipe but you need or want to serve more than 3 people, make my full-size pumpkin cheesecake recipe. That recipe is adapted so that there’s enough pumpkin cheesecake batter for a full 9 1/2 inch springform pan. These creamy mini pumpkin cheesecakes are packed full of pumpkin pie flavor! They're great topped with maple syrup and whipped cream AND sharing isn't necessary! Preheat oven to 325 degrees. Line the outside of 3 (4 inch) springform pans with heavy duty tin foil. I add two layers of tin foil to prevent water from seeping in. Fill a 9x13 pan with about 1 inch of water. Place into the oven. In a medium bowl, add in the graham cracker crumbs, granulated sugar, and melted butter. Stir to combine. Add a third of the crust mixture into each of the springform pans. Press into the bottom of each pan. Set aside. In a large mixing bowl, add in the cream cheese and pumpkin puree. Beat on medium until creamy. To prevent any lumps in your cheesecake, add 1/2 cup pumpkin puree and beat into the cream cheese. Then add the remaining 1/2 cup and beat into cream cheese. Add in the brown sugar and granulated sugar and beat until incorporated. Add in the eggs, sour cream, heavy cream, pumpkin pie spice, and cinnamon. Beat until combined. Don't over-mix! Fill each 4 inch pan to the very top with cheesecake batter. Add the 3 springform pans into the pan with the water that's already in the oven. Bake for 40 - 45 minutes until the top of the cheesecakes are set. Turn off the oven and crack the door. Let the cheesecakes cool to room temperature and then place into the fridge to chill before serving. Add maple syrup and whipped cream to the tops of the cheesecakes and serve. If you want to check out more recipes from the virtual pumpkin party, head over to Cake Over Steak!